Invasive species or invasive culture? Look, i clearly understand that there are invasive and noxious weeds that can have negative consequences on ecosystems, but we have to grok that this is a consequence of living in the Anthropocene. There are complex dynamics afoot in the “invasive” species debate that include ecology, economics, ethics and psychology. Our European ancestors are responsible for much of the introduced species. Some good, some bad. While purple loosestrife is problematic, can the same be said for the honeybee or apple tree or earthworm? And over a long enough time span, don’t ecosystems eventually find balance after a disturbance? Ecologically speaking it seems that the effects of “invasive species” are a mixed bag usually coming down to semantics and whether or not a new introduction is labeled with the epithet. 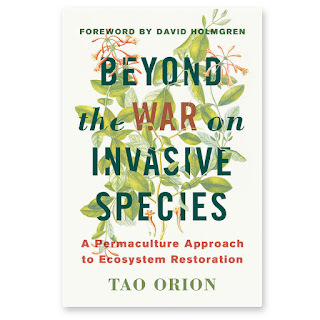 While ecological disturbance is a problem, we can’t blame it all on “invasive species.” How about this: if you want to blame ecosystem damage on one simplistic thing, blame it on “invasive culture” which is more to the point. You can’t demonize plants for reproducing themselves in the ways they evolved. They just happen to be in new places where (often) people of European descent introduced them by building their conception of society. So while there is ecology involved with the disturbing effects of opportunistic and aggressive species, so too are economics. It’s big business to try and eradicate these plants and “restore” the “native” ecosystem. But the concept of restoring a native ecosystem is flawed because it starts at an arbitrary point in history (before Columbus) and then presumes that that “pristine” ecosystem was somehow static. But we all know that ecosystems are constantly changing and evolving and species move all over, sometimes with the help of humans and sometimes not. In eradication efforts, while mechanical and hand removal labor costs add up over time, herbicides wind up looking like the cheaper option to land managers (government, conservation groups, land trusts, farmers, etc). So a beneficiary of the concept of invasive eradication is herbicide companies like Monsanto. That’s an economic consideration in this debate, which then yields a feedback loop to exaggerated ecological and economic damage in order to justify large orders of herbicides. The cozy relationships between big business and universities is no secret. An ethical component comes down to the question of who controls ecosystems? Or what is our duty of care if we introduce species that disturb ecosystems? In order to answer those questions you have to ask the larger philosophical question of what is our role or place or position in nature? Should we be humble or authoritarian in our answers? Should we seek to control nature or find some other kind of balance? As far as the psychological dimension, we would be foolish to overlook the grief and guilt associated with the disturbance that nuisance species create. In some ways i think we project the drama and tragedy of the process of colonization onto the ecological dynamics here. Where the demonized “invaders” are wiping out the preferred “natives.” In order to protect the natives we must wage war on the invaders, and the resulting efforts are somehow a sideways (if white savior) attempt at a collective reconciliation for the genocide of Native American peoples. While this might not be front and center for most people in the invasive species debate, i think it is a part of it. Here is a book review that covers some of this nuance. It’s important to emphasize again that all of these dynamics are present in the debate with different amounts of weight behind them, depending on who is doing the talking. This article takes a deeper dive into the psychological dynamics of guilt, fear and disgust with invasive species and new introductions. There is a short ideological bridge from invasive species to xenophobia and racism.